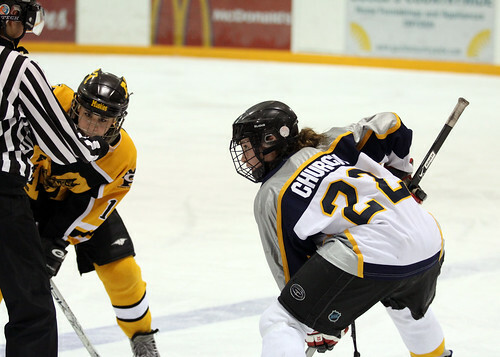 Morgan Church takes the faceoff Tuesday night in Dryden vs. the Muskies. The Dryden Eagles Girls hockey team continued their winning streak tonight with a decisive 7-4 victory over Fort Frances. The Muskies opened up scoring in the first, but were eventually outgunned by the Eagles in their final home game of the season. Kyley Engstrom, Morgan Church and Alex Wesley lead the way with two goals each, while Lauren Shoguchi added a single. Engstrom and Shoguchi both had three assists, Alex Wesley had two and Morgan Church, Kristin Bartlett and Alex Reid had single assists. The girls head to Fort Frances on Tuesday to wrap up the regular season.